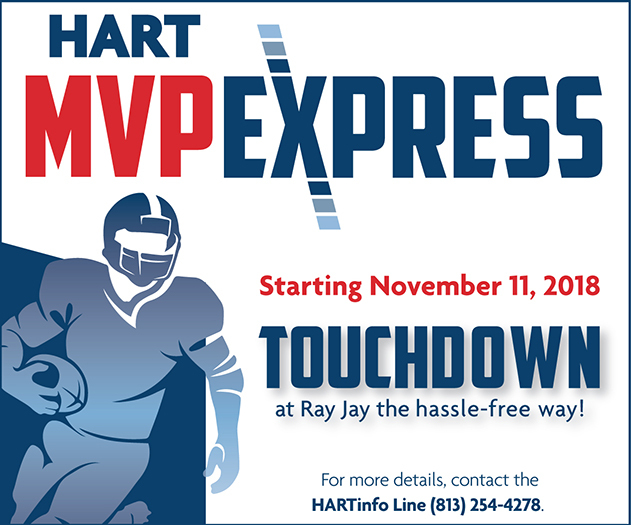 Be the MVP of your tailgate on the HART MVP Express! HART MVP Express service is just $10.00 round trip and begins at 10:30 a.m. for 1:00 p.m. kickoffs and three hours ahead of all other kickoffs. Plant High School - South Tampa - 2415 S. Himes Ave.
King High School - Temple Terrace - N. 56th St. Sligh Ave.
Alonso High School - Town 'N Country - 8302 Montague St.
Westshore Transfer Center - Westshore Blvd., south of Spruce St. Fans will be dropped off and picked up at the West Tampa Transfer Center, located across the street from Raymond James Stadium. Click here​ to purchase your MVP Express pass. Return service begins in the fourth quarter and continues for two hours after game end. Fans can now park, gather together at meeting points across Hillsborough County, and travel to and from the game together in a hassle-free environment. This relaxing and fun trip provides fans the opportunity to participate in all of the gameday festivities – without the frustrations of driving and game traffic. Fans using the HART MVP Express must follow the NFL bag policy​ and only bring clear, see-through bags (12” x 6” x 12” max) to the game. Belongings cannot be stored on the shuttle during the game. HART is piloting this shuttle service to gauge interest in long-term service. The MVP Express could possibly expand to serve other sporting events including the Tampa Bay Lightning, the Outback Bowl, Super Bowl, etc. Tackle gameday traffic with the MVP Express! Go Bucs! Still have questions? Check out the Frequently Asked Questions. Fans using the HART MVP Express must follow the NFL bag policy and only bring clear, see-through bags (12” x 6” x 12” max) to the game. Belongings cannot be stored on the shuttle during the game. ​The ​HART MetroRapid system features fewer stops, high frequency and advanced technology to help travelers get to their destinations quickly and conveniently.